Base notes: iris, musk Beautifully boxed; 175g / 6 oz with snuffer lid. Made in England. UPC 886266585105 Floris home fragrances date back to the 1800s where in our catalogue of 1851 a range entitled "For Perfuming Apartments" could be found. 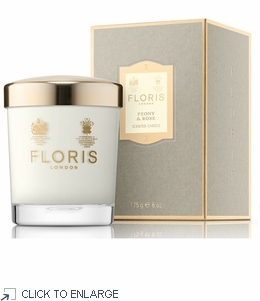 The Peony & Rose luxury scented candle by FLORIS London embodies femininity, conjuring modern apartments with rich dashes of luxury and poise. Handcrafted in England. Beautifully boxed; 175g / 6 oz with snuffer lid. Made in England.